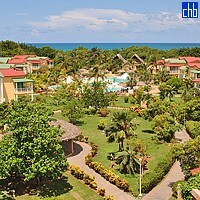 Iberostar Tainos is an excellent 4-star all-inclusive hotel located on a great Varadero beach, & is an ideal choice for couples & families seeking a relaxing break in the Cuban sunshine. Tainos Hotel has a great range of activities & entertainment for guests of all ages, both around the complex & on the beach. 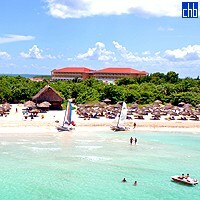 But the most memorable aspect of your stay is likely to be the warmth of the staff, noteworthy even by Cuban standards. This may be one of the Varadero’s smaller complexes & it is slightly tired in places but it is clean & well maintained by a friendly, helpful team. With lots of daily/evening entertainment & activities including tennis, archery, aerobics & watersports, there is plenty to do by day & night. There are also a number of activities for children & teenagers. 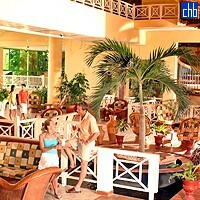 Tainos hotel is just yards from a stunning beach where guests can enjoy soft & alcoholic drinks at the beach bar. The hotel has 5 bars including a new poolside bar, the “Parrilla Taína” & a lobby bar, where you can enjoy table service as you relax & listen to live music. 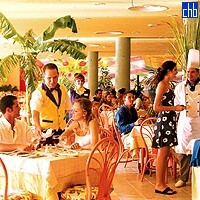 The food at hotel Iberostar Tainos is of a good standard with two a la carte restaurants (Japanese & Cuban), a buffet restaurant & snack bar. With a fine beach, great food & drink & activities delivered with enthusiasm by friendly staff, hotel Tainos is a good choice for anyone seeking a relaxing holiday, particularly families & couples. Tainos has 272 standard ensuite rooms, spread between the main building & a number of colourful two-storey bungalows, which are quieter & closer to the beach. The décor is slightly dated but rooms are spacious & bright, with regular towel art left by friendly maids. 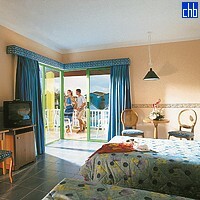 All rooms have either a terrace or balcony, providing views of the gardens or ocean.